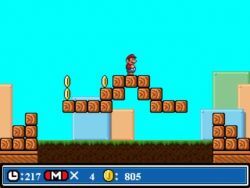 Mario Chameleon is another platform remake of the legendary Super Mario Bro's. There is not a lot to this game, no help, no configuration, but once you've figured out the keys it is quite fun. 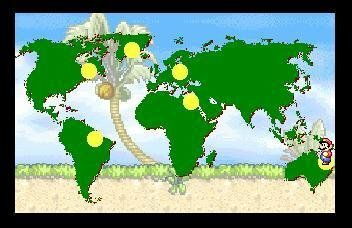 You are presented with a world map marked with each of Mario's destinations. Your starting point is Australia and you must travel to North America, South America, Greenland and other areas of the world. 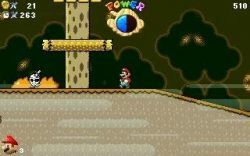 There is a whole troupe of new enemies in Mario Chameleon and the tact of jumping on their heads doesn't work anymore! 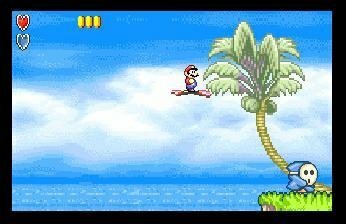 You can jump on top of a turtle without it killing you, you simply ride on its back until you jump off, but don't try that on any of the other enemies! 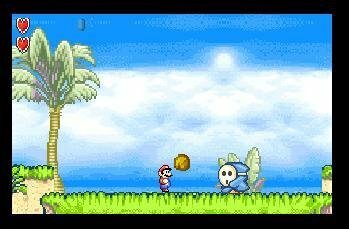 You can pick coconuts off the trees and throw them at your enemies to kill them. 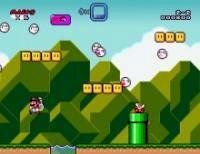 Other extras like magic carpets to ride on make this Mario game an interesting new adventure. 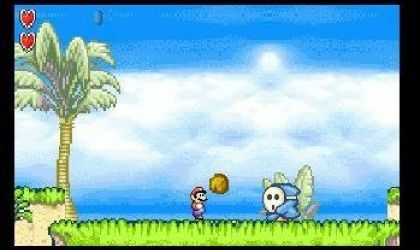 Pity about the graphics, but the original Mario wasn't any better. It's fun because there are tons of unique levels, but when you die you start all over again. Plus you can't "kill" things. This is not the best I've played, but if you are just looking for something to do you might play it for a while.